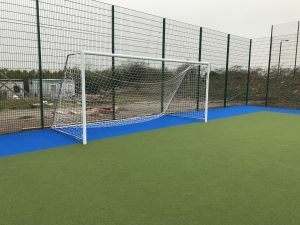 High Grange School proudly announces the completion of it’s brand new outside multi-purpose sports facility. This sports facility situated behind the school gymnasium and adds a further dimension the already fantastic existing sport facilities the school already has. This multi-purpose sports facility has already proved to be a success with students and staff. This new facility has been in the planning as part of the schools continuous drive towards improving the schools facilities further. Already this week our students have been out testing the new playing surface in all weather conditions every lunch time. This sports facilities will mean that High Grange School can host various competitive matches against other schools within the midlands area. The Physical Education department are planning on hosting a mini football tournament to officially open the sports facility. We would like to thank the board of directors at High Grange for further investing in the schools facilities in order to achieve the best outcomes for all our students and young people.